What is a tweet chat? One Hour of Killer Lead Gen. Don’t Miss It. What is a tweet chat? One of my favorite social media tools and an exciting way to discover new people, products, partners and… prospects. These are live Twitter events focused around a general topic and often scheduled for the same time and day, and held weekly or monthly. They’re about an hour long. Chats are moderated and engaged by a media outlet, individual, company or organization. You can host a tweet chat or participate in one. 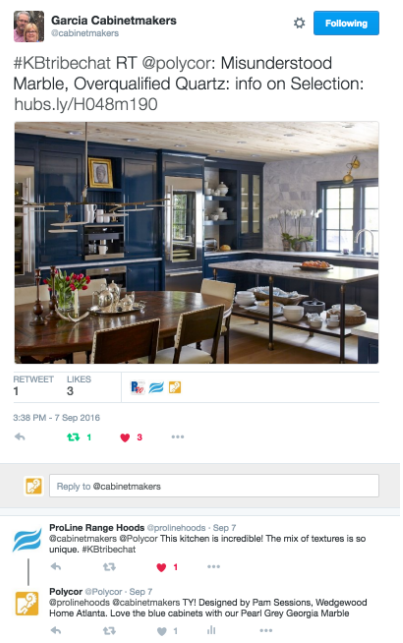 For instance, #KBTribeChat, a kitchen and bath industry event, is hosted and moderated by Garcia Cabinet Makers. 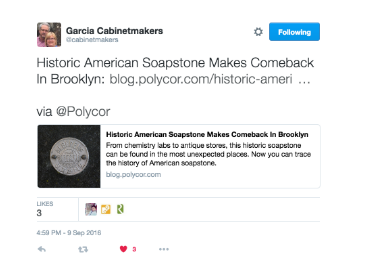 My team and I participate in these weekly chats on behalf of our materials clients, Polycor and Vetrazzo, both countertop companies. Tweet chats offer quick opportunities to gain access to the key players on social media in your industry. People who can influence others and talk up your products or services. What make tweet chats unique? The people on the chat aren’t necessarily the same people you’re going to see at a networking event anytime soon (or ever). You can save the plane or subway ticket and talk to them right on Twitter. It’s a great place to showcase your industry knowledge. You’re not going to bust out a pic, video or blog in that cocktail party but on the tweet chat you can. 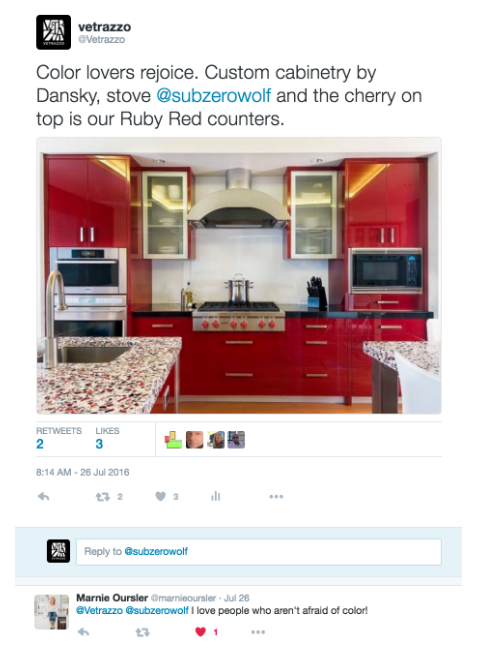 During a tweet chat at an ICFF industry event I mentioned my agency’s colorful office design and designer Bobby Berk liked the tweet. 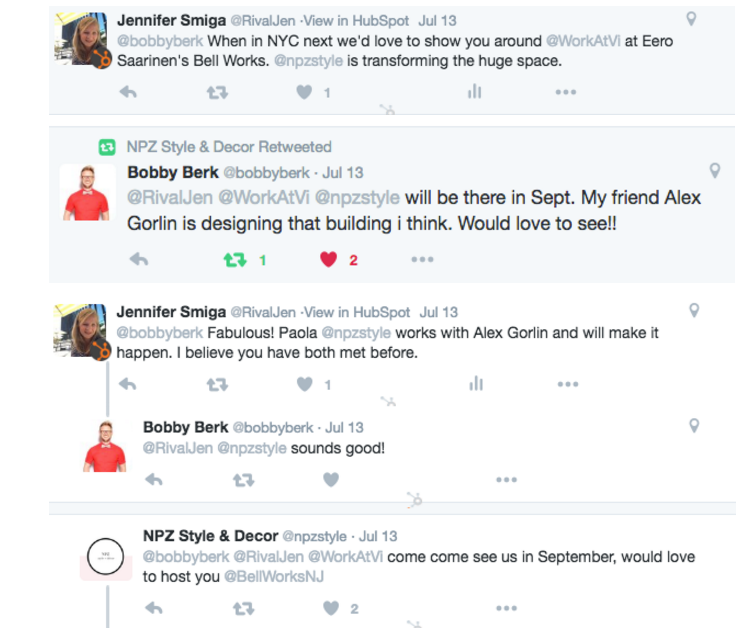 Months later I engaged Bobby again on Twitter connecting him with the building’s interior designer and scheduling a visit the space, a midcentury Eero Saarinen iconic structure called Bell Works. And true to his word, Bobby Berk paid us a visit. 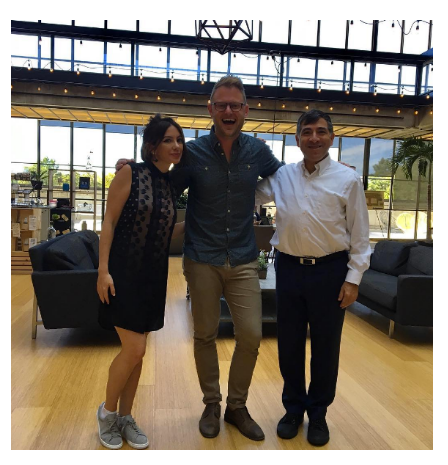 Here he is with Paula Zamudio of NPZ Style + Decor, and Ralph Zucker, president of Somerset Development and the creator of the Bell Works project. I love when social media leads to social in real life! 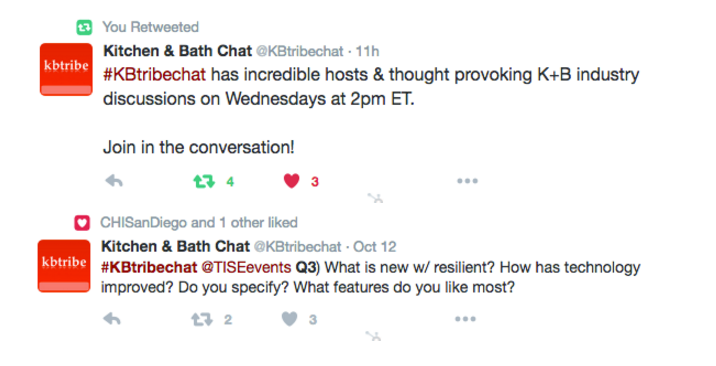 In many cases, companies sponsor and/or moderate the questions in a tweet chat. Through pics, links to blogs and conversations, they soft sell products, gauge interest in potential products, connect with social influences and prospective brand ambassadors, and boost attendance at events. 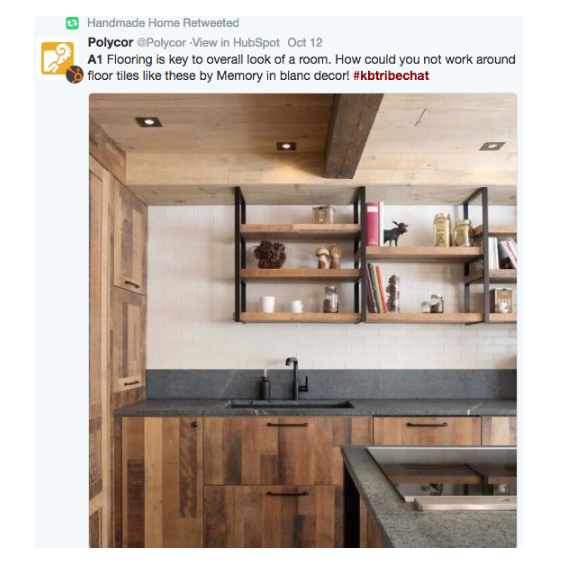 Last week’s #KBTribeChat was sponsored by The International Surfaces Event, a materials trade show, and we tweeted from our client @Polycor’s account. How do tweet chats work? A hashtag is used to filter all the tweets for the chat’s single conversation. i.e. #ModernMonday which is run by Dwell and Design Milk. The moderator will pose questions tagged Q1, Q2… to prompt responses from participants who will answer with A1, A2. Here’s an example of a predetermined question gave us an organic way of introducing our client’s product into a conversation. In the same chat we had the opportunity to strengthen our client’s relationships with one of its distributors, Walker Zanger. Here, as Polycor we, tweeted our support of Walker Zanger’s charity efforts to recycle luxury home building materials. Good for the planet, good for the partnership and good for the people helped. That’s the kind of cocktail party like conversation and collaboration you only get when people have a place to interact online. The best way to get comfortable engaging in a tweet chat is to watch one first and then jump in yourself next time. (You don’t have to answer every question but when you do, don’t forget the tweet chat official hashtag or your tweets won’t be part of the conversation). A chat is not about the sell. It's about showing up and communicating. Relating to people in your industry, being helpful and supporting one another. Your product or service is secondary to the relationships you are starting and sustaining in these weekly conversations. (Often you’ll find many of the same people coming back every week.) Showing up regularly will keep you top of mind. One way to engage with people is to retweet with a relevant quote / comment. Thank people who retweet, quote, like your tweets. Thank people for following you. Follow people back who you have interest in. You will not always be able to know if this person is valuable to you until later. More here on how to develop serendipitous relationships via Twitter. 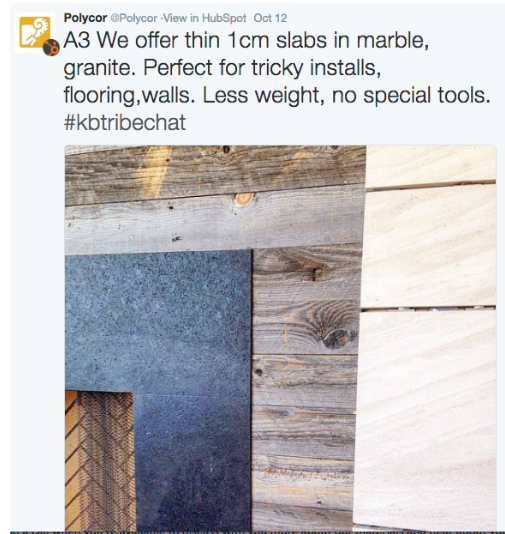 We connected with the cabinet makers who run the KBTribeChat tweetchat. Their social media manager often shares our content, and we’ve also been able to have the opportunity to host two tweet chats and provide our own questions. A great opportunity to connect with designers and to gain visibility and awareness. Respond to the questions with the hashtag and relevant answer. Ie. start a tweet with the answer to their question. These will most likely be numbered. See example below. You will first need to lay out your goals for participating. Like anything, don’t waste time or money investing in the work with no end goal. One of our goals with our client Vetrazzo, makers of recycled glass countertops, is to connect them with designers who love to use bold color in their designs. Through a chat we connected with DIY Network host of Big Beach Builds Marnie Oursler. Marnie is very active with the Vetrazzo brand online and represents a huge opportunity to showcase and use our product. Our continued communication on Twitter and tweet chats led to a phone call and a confirmation that they will use the materials in the near future. Score for social pr! Is that tweet chat worth your time? How many followers does the tweet chat host have? Note quality can be more important than numbers. Review the participation and the host’s followers to gauge whether the chat is right for you. How much engagement does the tweet chat hashtag get? Retweets, answers, questions. Are large companies participating? If yes, that’s a good indication that the host is credible and offers value to its sponsors. 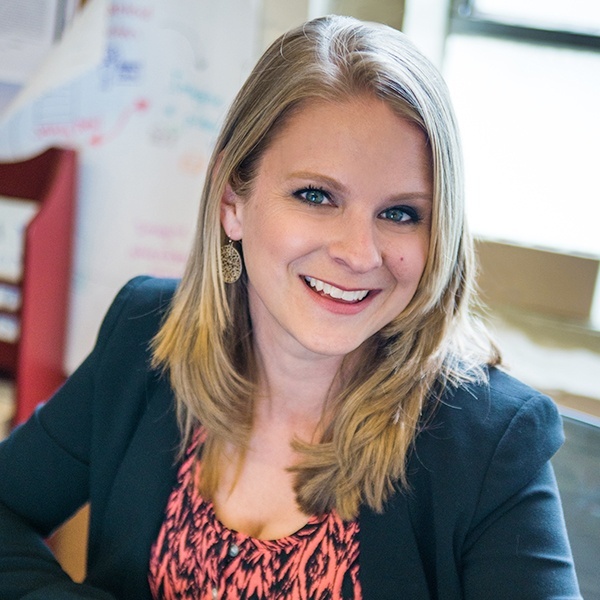 Are your target personas on the chat? Are you trying to reach brand ambassadors or your consumers directly? Know your target market, media or brand ambassadors and if they are on the chat. More on brand ambassadors here. Who should do the chatting? The person who should be tweeting should understand your company, growth goals, strategies and trends. It also helps if they have a genuine love for the subject matter. Shannon and I take turns writing answers for tweet chats based on our expertise related to the topic. We both are design lovers, but Shannon has very recent remodeling and DIY design experience to pull from, and I have an art background that helps me with color and trend topics. Who should the participate in your tweet chat? Whoever owns your social media marketing, whether your internal pr rep, agency or marketing associate, this representative on Twitter should also be the one to manage collaborations that develop out of social media work, like brand partnerships. Being active on Twitter is great for business, but it’s not enough. Twitter only provides lead gen when you are engaging regularly with your target audience. Carefully chosen tweet chats are opportunities for leads in pr, marketing and sales. Whether it be as a source for a blogger or news outlet, or as an expert in your industry for a referral. Hop on a tweet chat this week and see for yourself all the conversations happening in your industry, and next week, you’ll be ready to start your own Twitter lead gen.
You can do even more with Twitter if you stay engaged. Learn how to partner your brand with an ambassador on social media. Download our free guide.